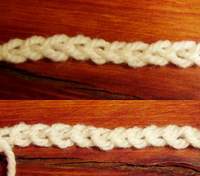 The chain stitch is the first actual stitch you will learn in crochet. It is the most basic stitch and the action you use to work it forms the basis of all crochet stitches. Master this one and you'll have the rest down in no time. The top photo shows the 'front' of the chain stitch, which looks like a row of 'V's sitting inside one another. The bottom image shows the 'back' of the stitch - this has 'bumps' running down the center of the line of 'V's. As a beginner, you should ideally be using a smooth worsted weight yarn, as it's easier to see how the stitches are formed, and an appropriate size hook - a 6.00mm J/10 should work well. You start the chain stitch by forming an initial loop called a 'slip knot'. The slip knot is named because it forms a loop whose size can be altered due to the knot being able to 'slip' along the yarn. leave about a 6 inch tail of the loose end of yarn then form a circle. Place the 'ball' end of yarn behind this circle and hold it in place. From the front grasp the crossover yarn and pull it through the circle to the front. Tighten the knot by pulling the tail end of yarn. You should now have a loop with a knot that can slide up and down. Here you can check out some photo instructions to help you out with forming a slip knot, holding the yarn and hook, and working the chain stitch. Now that you have a slip knot tied you can learn to work the chain stitch. Slip the loop onto a crochet hook appropriate to the thickness of yarn you are using and tighten it up a little. It should still be allowed to move freely over the hook end. You should hold the hook either like a knife (hand over the top of the hook, fingers wrapped loosely underneath), or like a pen (hook resting gently on the soft part of your hand between forefinger and thumb), leaving the hook plus a couple of inches free as the 'working area'. Some prefer to weave the yarn between the fingers of the opposite hand to create some tension. I prefer to allow the yarn to gently flow between my palm and ring/pinkie fingers, using my forefinger as the tensioning device. There is no right or wrong way, just what feels comfortable to you. Hold the tail end of yarn between middle finger and thumb, hold your ball end of yarn as it feels comfortable to you, then **push your hook slighty away from you and behind the ball end of yarn, bring the hook up so that the yarn comes over the top of the hook (called yarn over), then pull that newly hooked yarn through the loop aleady on the hook. Congratulations! That's your first chain stitch! Great job! Now repeat from ** and practice making more chains. NEVER count the loop on the hook when you are counting stitches - that is the working loop only - not a chain stitch. ALWAYS bring the YARN OVER the hook not under when forming your stitches, unless otherwise stated by the pattern instructions. Aim to get your chains as even as possible. Pattern instructions almost always suggest that you learn to CHAIN LOOSELY. If you find your chain stitch is tight, try using a larger hook or relax your hands and allow the yarn to flow more easily. To ensure more uniform stitches here's a useful suggestion. I like to use my finger and thumb of my left hand to grab the chain as I am working. I shift my finger and thumb position closer to the hook about every 5 stitches or so as the chains are formed. This helps to support the chain, prevents it from twisting and allows me to pay attention to my tension as I form each chain stitch. Practice makes perfect. Keep practicing until you are confident making the chain stitch. Move on only when you are smoothly forming the chain and each stitch slips easily off the hook. When you're ready for the next step try single crochet. Return to Homepage from Chain Stitch.